Jun. 14, 2013 1:00 p.m.
Dale Leitner, Rikki Karba, Sandy Berube, Dorothy Mayall, Britney Benson, Bonnie Caskey, Jason Seghers from Alberta Cancer foundation. Everyone else is from Ensign Energy. 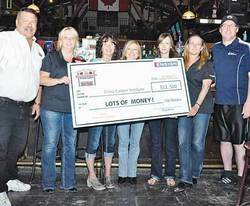 Almost $30,000 was raised for various charities.